Does Your OS Support Your Camera? What Does the V1 Price Plummet Say to Customers? The Q Times 10 = Q? Will Fujifilm Get the Message This Time? How Much Will You Pay For Features? Why is Fujifilm Suing Google? What's the Right Size Sensor? Anyone Leica Black and White? Sony Digital Imaging 75% of Its Former Self? What's With All the Mirrorless Cameras? 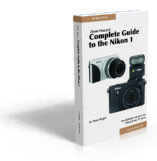 What's a Complete Mirrorless System? Is That a Mirror on Your Mirrorless? Do Panasonic and Olympus Know About Each Other? Do You Need an Eye Level Viewfinder? How Much Tripod Do You Need? What Should I Look for in Video? Samsung 45mm f/1.8 and 12-24mm f/4-5.6 lenses—Samsung used Photokina to show the prototypes for these lenses that were long on the road map (though the 45mm used to be a 55mm in the old road map). A product announcement was made with a few more details, so I've started database pages for these lenses, though there are still some gaps in knowledge I'll try to get answers to. Leica Does the Splits—Leica announced quite a bit of product and a great deal of detail last night at their latest Photokina coming out party. First, Leica is no longer going to use model numbers on the high end lineup (even Apple had to renege some on that idea). We just get an S, an M, and a new M-E. The M&M-E are the mirrorless entries, and there is both lots of new news and old news here. Let's see if I can summarize: the M-E basically takes the current M9 and replaces it. Basically the same camera (same sensor, same LCD, same everything) just updated a bit internally and now missing any model name (it's engraved on the hot shoe!). No real news there other than the drop in price to US$5450. The big news is the new M: here everything changes, yet stays the same ;~). The new M gets a CMOSIS-sourced 24mp CMOS sensor that Leica apparently controls, a 3" 920k dot LCD, Live View and HD video (! 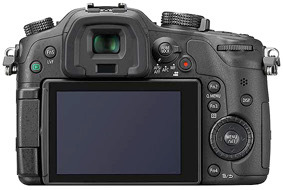 ), new button arrangements (and a command dial and joystick), the ability to use R lenses (with adapter), focus peaking with 10x zoom (in Live View), a 3 fps burst rate, and optional EVF, and a host of internal changes (including official adoption of the Maestro imaging ASIC from the S model). Yet the new M looks (and mostly works) very much like the old M's. The new M is US$6950, and will be available in early 2013. New Olympus 17mm lens—Yep, another development announcement, but for lenses I think that's probably the smart thing to do, as it gives people more confidence in the things that will be available for the system they're buying into. The existing 17mm f/2.8 has been much maligned since it came out. Optically, it's weakest of the small primes (though probably not as weak as some make it out to be). But at f/2.8 it wasn't very fast, and that was the bigger problem with the early Pen cameras, which had a very low high ISO ceiling. As part of their other product announcements, Olympus gave us a quick look at the upcoming 17mm f/1.8 lens. It looks a lot like the 12mm: solid build, bigger (but not real big), that all silver look Olympus has been perpetuating (but you can get around with limited edition black versions). In other words, it looks like another nice prime in the 12mm, 45mm, 70mm series. Now we just need a 25mm and maybe a 35mm and we'd have the 24-135mm prime range all dolled up in full metal jackets. 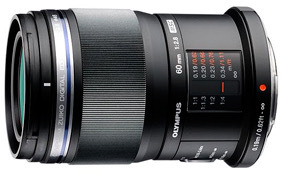 Nice addition Olympus; keep them coming (dare we ask for a 10mm and 150mm?). Panasonic 35-100mm f/2.8 lens—It's official, after surviving its world "I might be coming" tour and is "now definitely coming." No word on price or actual availability date yet, but we went through this same thing with the 12-35mm: I'll bet US$1300 and by end of year. All the details that are known (which are a lot) are at the linked database page for your perusal. 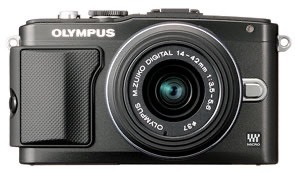 Olympus E-PL5 and E-PM2—The bottom and the middle of the Pen range got their expected updates, with the OM-D's 16mp sensor and touch screen at the heart of the changes (the screen still tilts). The E-PL5 also gets the E-P3 style changeable grip, some AF performance improvements, and all the latest Olympus image processing. This camera tends to be the big seller in the Olympus m4/3 lineup (though typically at a discount), so the additions and performance improvements are all welcome. The E-PM2 also gets the 16mp sensor and touch screen, but retains the previous model's simplified interface and controls. Both cameras get a few more subtle, but desirable features. For example, 1/250 flash sync. Surprisingly, there is very little feature differentiation in the two models, with the primary difference being the fixed (PM2) versus tilting (PL5) LCD, and the smaller size and reduced controls of the E-PM2. Overall, it'll be the new 16mp sensor that attracts folks the most, as its proven to be very competent in the OM-D E-M5. Meanwhile, the E-P (no L) series seems to be taking a rest. There's nothing really in the E-P3 that isn't now in the E-PL5 (and a few things in the E-PL5 that aren't in the E-P3). I think if and when we see the P come back, it'll be with a built-in EVF, which then means that the E-M5 probably also has to take a step upwards. There's certainly room for another model, but right now the lineup is a little out of balance (not well spaced to clearly different price points). Panasonic GH3—This update of a well-regarded camera shows that Panasonic has been paying attention to customer requests. Since the GH models have always been strong video cameras, once again we get some state-of-the-art video implementations, including the ability to record up to 1080P/60 and at very high (three times higher than AVCHD) bit rates. The body has gotten slightly bigger and heavier, but has been beefed up in build, too, including splashproofness. No less than five programmable function buttons are available, and we still have the positionable LCD, only with a full touch screen implementation. The built-in WiFi can talk to smartphones and can even pick up GPS info from the mobile device to be recorded with the EXIF data. Top that off with improvement to the EVF and a imaging sensor said to have more dynamic range and finer tonality, and this all looks like a strong update to a classic camera. One thing I forgot to mention earlier: the camera is sold as NTSC or PAL, and the PAL regions still have the 29-minute time limitation on video in place. US$1300 body only. But talk about not controlling your own announcement. Samy's posted reasonably full specs, photos, price, and started taking pre-orders over the weekend (really, pre-orders before announcements?). Philip Bloom, the videographer that made the GH1's video reputation early on, even had leaks of his material this weekend. dpreview even decided to post specs prior to Panasonic's press conference, which is unusual for them, as they generally respect press embargoes (but once everyone else breaks an embargo, timely sites look bad if they don't jump in). This, on top of a ton of leaks over the past few weeks. So, we're either to believe that Panasonic wanted all that pre-leaking to happen for some reason, or their marketing department isn't competent enough to keep a new product under wraps until announcement. This last possibility is bad news for all of us. What usually happens is that the Japanese companies retract from the global photography community a bit more in situations like this, because they fear that any discussion with photographers or photographic press leads to leaks. Pre-announcement embargoes aren't rocket science. But they do require a lot of attention to detail, and they require real punishment to those that break them. Olympus 60mm f/2.8 Macro—Teased earlier in the year by Olympus, the 60mm f/2.8 was officially announced at Photokina. No big surprises here, though this is a larger lens than I think most people expect, especially with its optional (again!) lens hood mounted. US$500. Sony NEX-6—Sony has squeezed a model between the NEX-5R and the NEX-7, taking good things from both and creating something that will likely resonate with a lot of users. Basically the 16mp plus phase detect autofocus imaging sensor of the NEX-5R, the Play Memories apps and WiFi of the NEX-5R, in a body with a 2.36m dot EVF viewfinder akin to the NEX-7. The controls are NEX-5R inspired instead of the extended NEX-7 dials, plus we get a pop-up flash. Coupled with the camera in a US$1000 kit is the new 16-50mm f/3.5-5.6 powered zoom, which collapses to only 30mm in depth when retracted. Camera kit ships in November, lens by itself in January. I'll have more to say about this camera in my NEX wrap-up towards the end of Photokina, but this is another strong offering from Sony. Sony 35mm f/1.8 OSS NEX lens—This "normal" fast prime will list for US$450 and ship in November. It is compact, yet still optically stabilized. Sony 10-18mm f/4 OSS NEX lens—This wide angle zoom lists for US$850 and will also ship in November. Pentax Q10—See disappointments. But the rumors of its existence were true. Fujifilm X-E1—Almost exactly what the doctor, uh, I mean customer, ordered. A less expensive, faster, smaller, and lighter X-Pro1 with the only thing missing being the complex and over-hyped hybrid viewfinder. A straight EVF is good enough, thank you. Coupled with the pre-announced lenses (14mm and 18-55mm), there are going to be a lot of happy folk out there, and the NEX-7 starts to look vulnerable due to lack of similar excellent optics. Fujifilm may be a niche player, but they're starting to understand how to appeal to their niche dwellers.